For open tours on boards of 7 to 12 cells see the separate study on the Smallest Knight-Tourable Boards. On larger boards we tend to concentrate on special cases such as tours with symmetry. In open tours any symmetry is necessarily binary (that is with a single axis of symmetry or with 180° rotation). The tours collected here are not the result of any particularly systematic study, just an accumulation of various examples, so there is obviously scope for further work. Boards with an odd number of cells of course only admit open tours. Some boards with an even number of cells do not admit closed tours, though pseudotours and open tours may be possible. Similarly some boards (e.g. 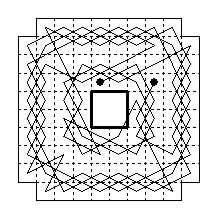 the 8×8 chessboard) do not admit quaternary symmetry, but asymmetric open tours on these boards may approximate to quaternary symmetry, with only one or two moves deviating. 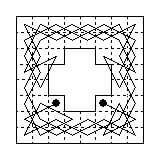 By omitting two cells from the untourable 3×5 board two centrosymmetric tours are possible, and also eight asymmetric tours, two on each of four symmetric boards (one of which has a hole). There are also two asymmetric board shapes, each tourable in eight ways. The four diagrams below solve the problem of a maximum length open knight path on the 3×5, by omitting one cell, which has to be a corner cell. No complete tour is possible on the 4×4 board. The diagrams shown here solve the problem of a maximum length open knight path on this board. 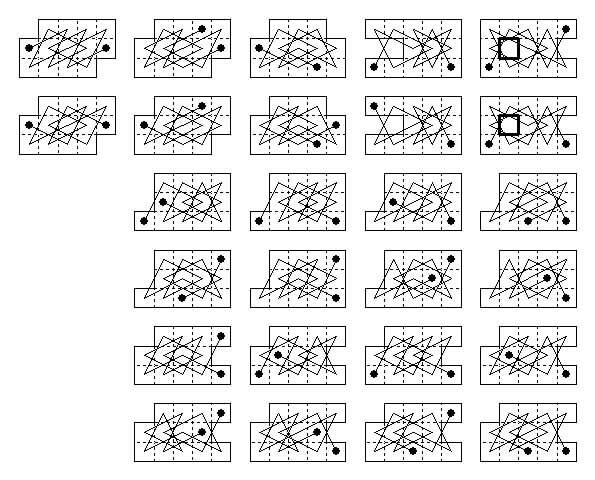 There are 20 distinct 15-cell open paths on the 4×4 board, omitting one corner cell. They all have at least one end in a corner (there are in fact 24 directed tours from a given corner since the 4 corner-to-corner cases can be reflected in the diagonal through the missing cell). They are classified here according to the five end-positions. The 4x4 board has no tour, open or closed, but moving two corner cells will produce two centro-symmetric boards (with equal numbers of dark and light cells when chequered). 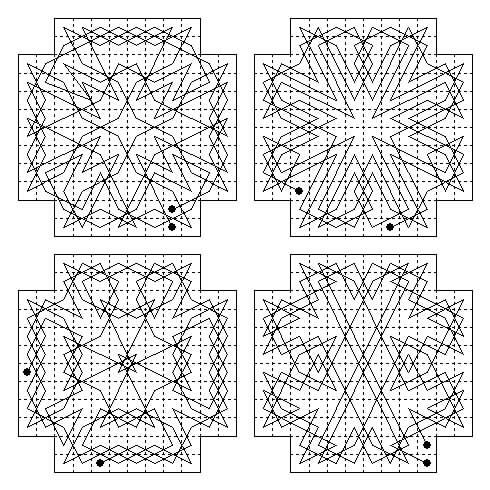 One of these has four symmetric closed tours (see the Oblique Binary section). The other has no closed or symmetric tours but has 16 asymmetric open tours. One end must be in a cell next to a re-attached corner cell, and there are four other possible end-cells, each occurring four times. I show one example of each. 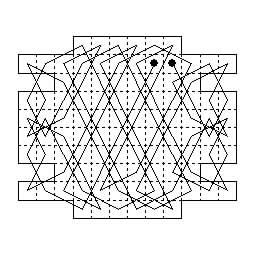 The problem of a maximum length open knight path on the 3×6 board is solved by open tours, omitting two cells. Two are symmetric (one with holes), and four asymmetric, three on an axi-symmetric shape. 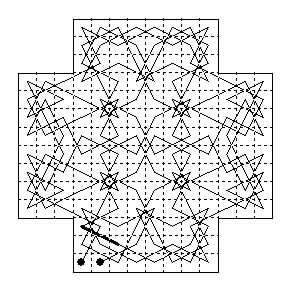 Here are some open tours with axial (Murraian) symmetry. The following examples are tours on the 4×5 board with two corner cells omitted. There are 18 symmetric open tours (including two reentrant cases derived from a Bergholtian closed tour). 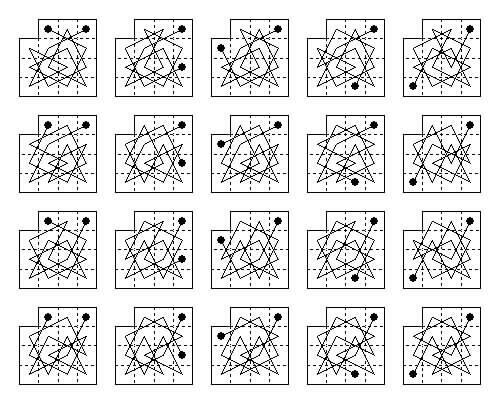 On the 24-cell 'top-hat' shaped board a closed tour is impossible, but there is a unique closed pseudotour of two 12-move circuits which can be linked in two ways to form open tours (given by Tolmatchoff and Vatriquant in L'Echiquier July 1929). Also shown is an asymmetric open tour of a 24 cell board, from L'Echiquier June 1928 (or January 1929?). A symmetric closed tour is also possible (see the binary oblique section), however a symmetric open tour is impossible since the centre point is not centre of a cell or mid-point of an edge. In the pages on rectangular boards we prove there are no symmetric open tours on the 5×6 board. 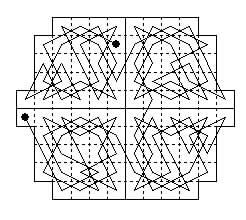 Since a symmetric open tour is possible on the 3×4 board, which is the middle area of the 5×6 board, this is perhaps surprising. Tours of this type are however possible by omitting a pair of corner cells. Here are six examples, out of 82 I found, one for each selection of one, three or five 'inner' moves. Two tours of a 28-cell board (formed as 3×4 + 4×4) by Vatriquant and Godron (L'Echiquier October 1927). Closed tours are also possible on this board. Another 28-cell board with symmetric open tours is the amusing 'leotard' board shown. The tours, from L'Echiquier February 1929 are attributed to Vatriquant, Post and Deprez, presumably working together. The first tour shown here, by Post, is from L'Echiquier March 1929. The second (Jelliss 1999) on the same board has the middle move in a different direction. Two tours from Indian sources. The first(from Naidu?) is a board derived from the 4×8 rectangle with some edge cells cut out and reattached elsewhere, to make a board with biaxial symmetry. Ambikadatta Vyasa Chaturanga Chaturi (1884) included the open tour shown here, on a 6×6 with four single-cell holes (rotated here so the "axis" is vertical). The 32-cell board below has octonary symmetry, and can be covered by a pseudotour of four 8-move circuits, but has no closed tours, and only two geometrically distinct open tours, differing only by which sides of the dashed lozenge are taken (Jelliss 2003). On the 'letterbox' board (5×7 with 1×3 hole) the border moves form two circuits, of 8 and 24 moves. Two open tours can be formed as shown by simple linking (Jelliss 2003). On the solitaire board of 33 cells there are 17 white and 16 black (assuming the corners are coloured white). A closed tour is not possible because of the odd number of cells. An open tour if possible must start and end on the majority colour white cells, but moves through the black cells a4, d1, d7, g4 form an 8-move short circuit (dotted moves in A), so no open tour is possible. Open tour by Haldeman on cross-shaped board, with mixture of axial and central symmetry. Open tour of 8×8 board with five 2×2 voids by Ambikadatta Vyasa Chaturanga Chaturi (1884). The first 48-cell open tour appears in Ambikadatta Vyasa Chaturanga Chaturi (1884). It joins together four copies of Euler's biaxial 12-cell tour. The second is from Lala Raja Babu Sahib Mo'allim ul Shatranj 1901. Open tour from Lala Raja Babu Sahib Mo'allim ul Shatranj 1901 (rotated). This open symmetric 73-cell tour was used in L'Echiquier January 1927 as a cryptotour spelling out a quotation from Gauss: "La mathematique est la reine des sciences et l'arithmetique est la reine des mathematiques". 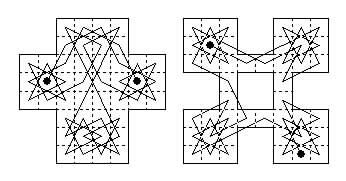 These two diagrams represent successive attempts at improved symmetry on the Greek Cross board of five 4×4 components. The one by H. E. Dudeney in Queen 12 November 1910 led to the far more symmetrical solution by E. Bergholt in Queen 22 January 1916. 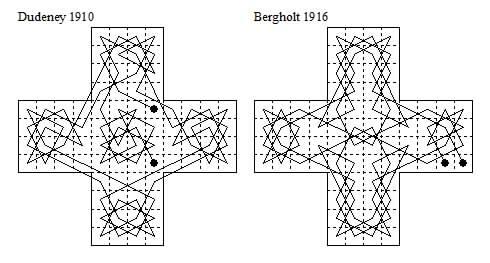 A handwritten note by Bergholt alongside his diagram Murray's copy of the Queen article asserts: "I have since constructed several still more remarkable for their elegance" but no others are given among the notes (but see his 84 cell closed tour with oblique quaternary symmetry). A tour on a board 10×10 with 8 cells removed collected by Murray from Zurcher Illustrierte 20 March 1931 an asymmetric open tour. A 100-cell board that can be regarded as 10×10 with the four corners moved to the middle of two sides. From L'Echiquier November 1929, asymmetric open tour in four quarters by D. Fiomare. A tour from Zurcher Illustrierte 26 June 1931 (rotated 90 degrees clockwise), on a board 10×12 = 120 minus 20 cells. These four open tours exhibit approximate direct quaternary symmetry. The first is from Essener Anzeiger 12 February 1933, the others are from the H. Staeker MS. This tour by Victor Gorgias from Westminster Papers 1871 is on the 160-cell board used for Four-Handed Chess which was popular at the time. It shows the maximum amount of direct quaternary symmetry possible in an open tour (and also a high degree of octonary symmetry). If the move printed as a heavy line is deleted and the two loose ends of the move are connected to the ends of the tour the result is a pseudotour.